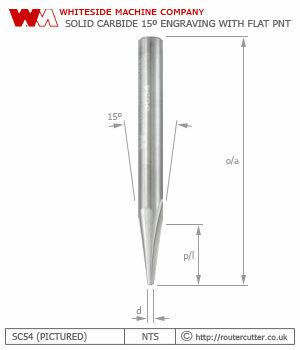 One piece solid carbide useful for engraving, lettering, veining, v-grooving, carving, etc. Whiteside SC54 with 15º included angle; the tip of the SC54 is machined to a 1.59mm (1/16") wide flat point; the point should therefore also prove to be more durable and less likely to break. Proudly made in the USA by Whiteside Machine Company and forms part of Whiteside's brand new series of CNC 2D and 3D carving router bits. Suitable for CNC applications, table mounted routers and hand-held routing.